Don’t succumb to back pain due to improper or inadequate ergonomics. The spine is made up of 24 bones that gives the body structure and houses the spinal cord. Other than protecting the spinal cord, the muscles and joints allow the spine to bend and twist. It’s important to keep the spine supported, especially when sitting to prevent and reduce, pain and injury. 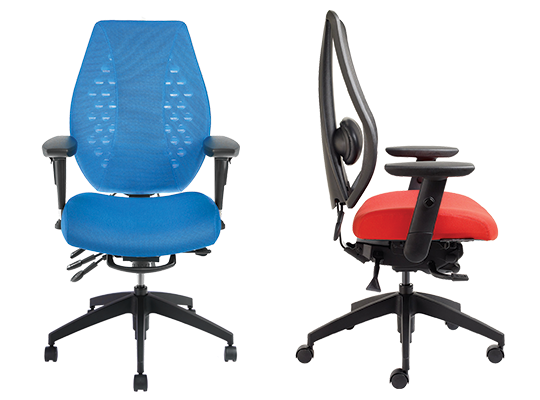 The lumbar and the thoracic spine are areas that can benefit from the built in support that all ergoCentric chairs have. Customized support options are also available for those who desire or need more. The spinal column is made up of three major section, the cervical spine, the thoracic spine and the lumbar spine. 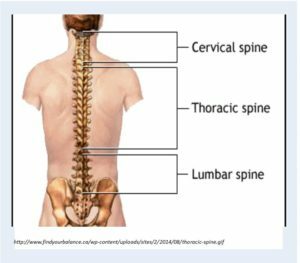 The lumbar spine is the bottom portion of the spine and the thoracic sits between the cervical spine in the neck and the lumbar spine in the lower back. Air Thoracic Systems and Air Lumbar Systems allow you to adjust the firmness of the thoracic and the lumbar support by squeezing a paddle and pumping air into the area. If you are someone that suffers from back pain and needs different levels of support, depending on the day, this is a great feature to have. The Air Lumbar System allows the amount and firmness of the lumbar support to be modified. This option is available on every ergoCentric backrest and adds to the lumbar support that is already built into every ergoCentric chair. 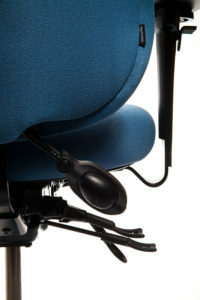 The Air Lumbar System is attached to the back height adjustment paddle. The air pump is easy to reach and operate from a seated position and is simply activated by squeezing the paddle. The Air Thoracic System is 12 inches in length down the back of the chair and the width is 4.5 to 5.5 inches. The pump is attached to the bottom right side of the backrest. The air pump provides adjustable support for the mid and upper thoracic spine and allows the shoulders to lean back while not extending the lumbar area forward. ergoCentric holds many unique patented components lending us to create the most adjustable chair available today. We are also one of the few mass chair manufactures able and willing to make these customizations to make sure you get the chair you need.